Jazz is a whole new ball game....BARTLETT loves it, says he can hear himself....interesting, new tunes, requiring lotsa focus and real listening every moment, what a treat. First, ANTONIO CARLOS JOBIM and HERE....what a 'tasty' guitarist. I'm gonna research him and let you know his history O.K?....Steve's doin' 'Triste' [thanks juan dalessandro] tonight. 'Triste' was written by Jobim, and is performed by 'Jazzerisima Jazz Trio' on video below. 'Triste' means 'sad' in Spanish...BUT, there's NOTHING sad about this song, gonna look up triste to make sure my Spanish is correct ....it's been along time since I've been around that language....Am I right? Does anyone know? 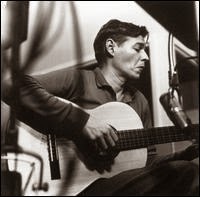 O.K....Antonio Carlos Jobim was the main creator of the 'Bossa Nova' style of music, he gets the credit for that on WIKIPEDIA. He was born in 1927 and was from Rio de Janeiro, Brazil. He wrote 'The Girl From Ipanema' [thanks fabtv ].. He died in 1994, but left lots of songs that are today known as 'Jazz Standards' and are well known internationally. Besides, being a singer/song writer, Jobim played piano and guitar. List of jazz video links...Cool JAZZ. Things that Steve's doing tonight and has done recently.